From Otto Wilhelm Thomé's Flora von Deutschland, Österreich und der Schweiz 1885, Gera, Germany. Capsicum annuum fruits from Wikipedia. Capsicum L., Sp. Pl. 1: 188 (1753) & Gen. Pl. ed. 5, 86 (1754); origin of name uncertain. 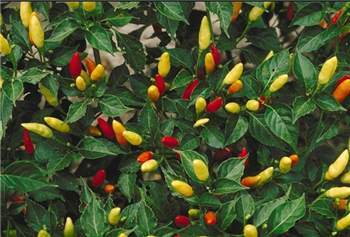 Type species: C. annuum L.
Erect or spreading herbs or short-lived, soft-wooded shrubs, glabrous or sparsely pubescent with simple hairs. Leaves alternate or paired, simple, entire, petiolate. Flowers solitary or a few in leaf axils and stem forks, bisexual, actinomorphic. Calyx shortly tubular, with 5 minute teeth, or teeth absent. Corolla stellate in Australian material, white, greenish-white or pale blue; limb deeply 5-lobed, the lobes valvate in bud. Stamens 5, equal in height, inserted at base of corolla-tube; anthers bilocular, connivent, basifixed, dehiscing by longitudinal slits. Ovary bilocular; stigma capitate. Fruit a berry, dryish or somewhat fleshy. Seeds reniform to sub-orbicular. A genus of c. 10 species, native to tropical America. Several species widely cultivated in temperate and tropical areas throughout the world as vegetables or pungent condiments (Chili, Paprika, Cayennne Pepper, red and green Peppers), or as ornamentals. Two closely related species naturalised in Australia as weeds common in waste ground. W.G. D'Arcy & W.H. Eshbaugh, New World peppers (Capsicum—Solanaceae) north of Columbia: A résumé, Baileya 19: 93–105 (1974); D.E. Symon, The solanaceous genera, Browallia, Capsicum, Cestrum, Cyphomandra, Hyoscyamus, Lycopersicon, Nierembergia, Physalis , Petunia, Salpichroa and Withania, naturalised in Australia, J. Adelaide Bot. Gard. 3: 133–166 (1981). 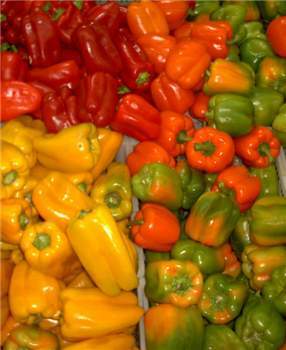 There have been no changes in the species of Capsicum since the Flora of Australia treatment but there have been studies on the composition and monophyly of the genus. Walsh & Hoot (2001) produced a molecular phylogeny indicating that the genus is monophyletic. B.M.Walsh & S.B.Hoot (2001). Phylogenetic relationships of Capsicum (Solanaceae) using DNA sequences from two noncoding regions:the chloroplast atpB-rbcL spacer region and nuclear waxy introns. Int. J. Plant Science 162: 1409-1418. Pedicels, after first flowering, usually one (rarely two) at each node; corolla white or blue; fruit globose, ovoid or oblong-conical, usually more than 6 mm diam. Pedicels, after first flowering, usually two or more at each node; corolla white or green; fruit narrowly conical to narrowly ellipsoid or fusiform, usually 3–6 mm diam. Key from Flora of Australia 29: 177 (1982).